Olive Somers, Kayden McIntyre and Harley Somers are all smiles after learning they won the local Battle of the Books competition. The trio will represent the Hannibal Central School District at the elementary level of the Oswego County Battle of the Books competition. 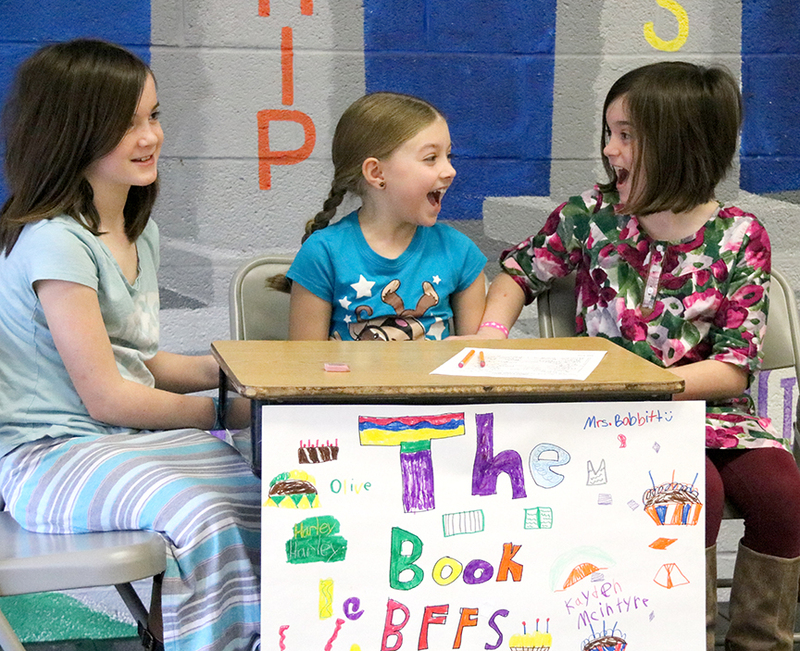 HANNIBAL – The Fairley Elementary School cafeteria was filled with excitement recently when four teams of students competed in a literary battle. As part of the Battle of the Books competition, avid bookworms chose to read a selection of books and answer questions that tested their knowledge. Twelve Fairley students accepted that challenge and faced off in two rounds of eight questions. Teams were awarded points if they correctly wrote down the title of the book and the author from which the question referenced. The first round was a close one, with “The Book BFFs” and “Reading Warriors” tied at 48 points and “The 3 Readeteers” and “Glitter Cats” within striking distance. The competition remained in a dead heat until “The Book BFFs,” comprised of Olive Somers, Kayden McIntyre and Harley Somers, correctly answered to take the lead and the eventual win. “It was awesome to win,” said Olive Somers, noting that she is looking forward to representing the Hannibal Central School District at the countywide competition.